New Jersey Gov. Chris Christie endorses Donald Trump for president in Fort Worth, Texas, on Friday. UPDATE (Feb. 26, 5:20 p.m.): Not long after Chris Christie endorsed Trump, Maine Gov. Paul LePage jumped on board the Trump train too. Well, this is big news: New Jersey Gov. Chris Christie endorsed Donald Trump for president on Friday. This is Trump’s first endorsement from a Republican governor, and, more to the point, Christie is easily the most mainstream Republican who has backed Trump so far. 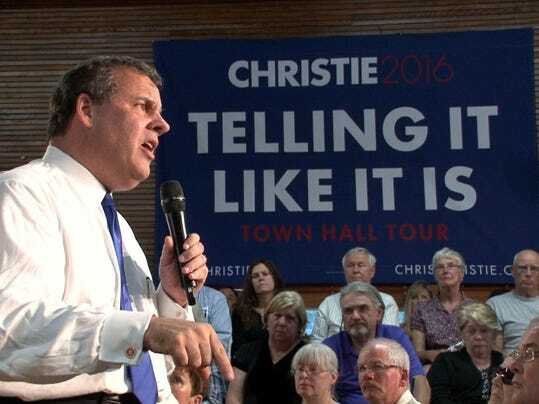 But just how surprising is Christie’s endorsement? Is it a one-off — or a sign of things to come? My view is that it’s not quite as shocking as it might seem. We noticed during the campaign that Christie was strangely reluctant to go after Trump, even after Trump spread mistruths about Muslims in New Jersey celebrating the Sept. 11 terror attacks. This seemed to us like a poor strategic choice for Christie, whose campaign slogan was “telling it like it is” and whose alpha-male personality gave him the chance to break out of the “establishment lane” and compete for Trump voters. There’s a lot that ties Christie and Trump together, however. Christie and Trump have a close personal relationship. Trump has long done business in Atlantic City and is quite popular among New Jersey Republicans. Neither Christie nor Trump is especially conservative, and they’re certainly not small-government conservatives. Both can rankle their fellow Republicans, as Christie did with his self-serving convention speech and embrace of President Obama during the 2012 campaign. Some of this may also be plain old opportunism. Trump is the most likely Republican nominee, after all. (Or at least one of the two most likely if you’re feeling very generous to Marco Rubio.) If nominated, Trump will have to pick a running mate. And if he’s elected president, he’ll have to appoint a Cabinet. Vice President Christie or Attorney General Christie ain’t all that far-fetched. Christie also replicates many of Trump’s weaknesses, however. Like Trump, Christie is very unpopular with general election voters. Like Trump, he has been accused of cronyism and corruption. Like Trump, he can come across as a bully. So Rubio and Ted Cruz won’t have to change their messaging all that much. Still, the Christie endorsement steps on Rubio’s buzz after a strong debate Thursday night and once again proves how easily Trump can control the news cycle. Christie, long a favorite subject of political reporters, will also be an effective surrogate for Trump. It probably also won’t be the last major endorsement for Trump. Even if most “party elites” continue to resist Trump, a lot of Republican elected officials will be looking after their own best interests instead of the collective good of the party. Some will back Trump because he’s popular in their states. Some will be looking for opportunities within a Trump administration. Some will agree with Trump’s views on immigration or his critique of the political establishment. So there will be more of these endorsements, probably. But it isn’t surprising that Christie is one of the first.